Starting June 26th, 2015 Netflix is releasing a whole new How to Train Your Dragon series called “Dragons: Race to the Edge.” Hiccup, toothless, Astrid, Fishlegs, Snotlout, Tuffnut, and Ruffnut will discover new artifacts and new dragons including one called Death Song. Personally I think the Death Song Looks like a beautiful butterfly. That is until I learned what the beautiful monstrosity is capable of…shiver. Check out the brand new sneak peek of the, “Death Song” and its horrific abilities. No, it has nothing to do with oily fish and bad mutton and everything to do with trapping dragons in an amber rock substance. When a mysterious song lures the dragons (and their riders!) to a remote island they find themselves in fatal danger. The discovery of a new dragon species, aptly named “Death Song,” imperils them all! 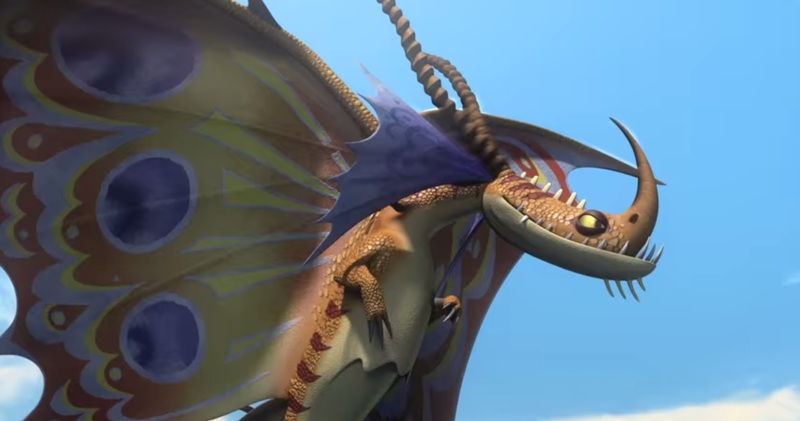 Check out another sneak peek of this upcoming series on my blog here: DreamWorks Dragons: Race to the Edge. It has an Indiana Jones vibe and tells a little more about the “Dragons: Race to the Edge” story. Be sure to watch this new series on Netflix making it’s debut June 26th, 2015.